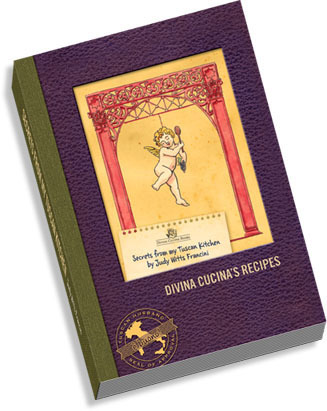 This summer I had the pleasure to meet Judy Witts Francini, known to all of us in the blogosphere as Divina Cucina – whose business card reads “food writer – market maven – cooking teacher – culinary guide – italian life coach”. Over lunch in Certaldo, we talked about her new cookbook “Secrets from my Tuscan Kitchen”, which has already sold 700 copies and is in its second printing. Judy generously gave me a copy of the book to review, and one copy to give away to you! At the end of this review you’ll find a question which you must answer correctly in the comments section of this post for a chance to win the book. Judy told me that the genesis of this book was the 20 years she spent teaching cooking in Florence. She did these market tours at San Lorenzo where she and the group chose their ingredients and then went to her kitchen to make lunch. Since they never knew what they’d end up cooking until they got the ingredients, she had to figure out the best way to supply people with take-home copies of the recipes. In the end, she gave her students handwritten notes and menus in a kind of photocopied book. All along, she would have loved to publish a cookbook… but she never had time to write it. She took the plunge last year, closed the cooking school, moved to the Tuscany countryside of Certaldo, and sat down to write the book. It was important to her to keep the handmade, handwritten feeling of her cooking-school book, so she chose to self-publish in order to have control over a number of interesting design factors. One of the things I appreciate the most about this book is that it is printed on off-white Fabriano paper. Fabriano is one of the earliest producers of paper in Italy. The mill began in the 13th century. It does not come cheap, and Judy has not spared any paper either, because recipes are printed only on one side, leaving room for your notes on the other, lined page. The ink chosen is brown, which looks very classy on this paper. The font is a custom designed handwriting font that reproduces Judy’s own neat printing. The binding is hand stiched and very solid – with the only drawback that you have to try to kill it to make the book lie flat while you’re cooking! In a totally unnecessary bid to write a very complete book review, I decided to test a few recipes. I’ve been living in Tuscany for 10 years and have had the benefit of learning how to cook Italian-style from my husband and his family, so I have never followed a recipe for Tuscan food. Nor, come to think of it, do I often follow any recipes at all, other than baking. Tuscan food is wonderfully simple. The point is to have few ingredients and that they should be evident in the final product. (I usually contrast this to the French love of smothering things in sauce.) So these are not difficult recipes, but they are really useful. There are a few things in the Tuscan diet that I did not know how to make but that I like, and now I know I can consult the book for them. Not to mention all the meat recipes which I may tackle some time if I have non-veggie guests over for dinner. So. First I tried the Salsa di Noci (Walnut sauce). I have always thought that this was a cream sauce, and so was pleased to see that the recipe calls for no cream: walnuts, garlic (omitted), bread soaked in milk, oil and salt, tossed in the blender. My blender chose to die halfway through this process, but it turned out good anyway. 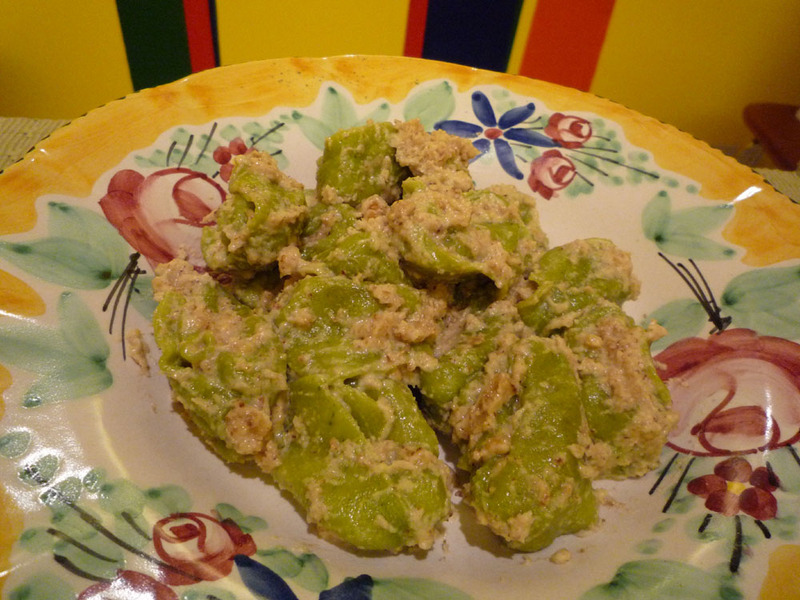 This can be eaten directly on bread (crostini) or served on fresh pasta or ravioli. We had it on green spinach ravioli filled with pecorino ricotta. Like the seal on the front of the book says, these recipes have the “Tuscan Husband Seal of Approval”. Indeed, my Tuscan husband was in seventh heaven. 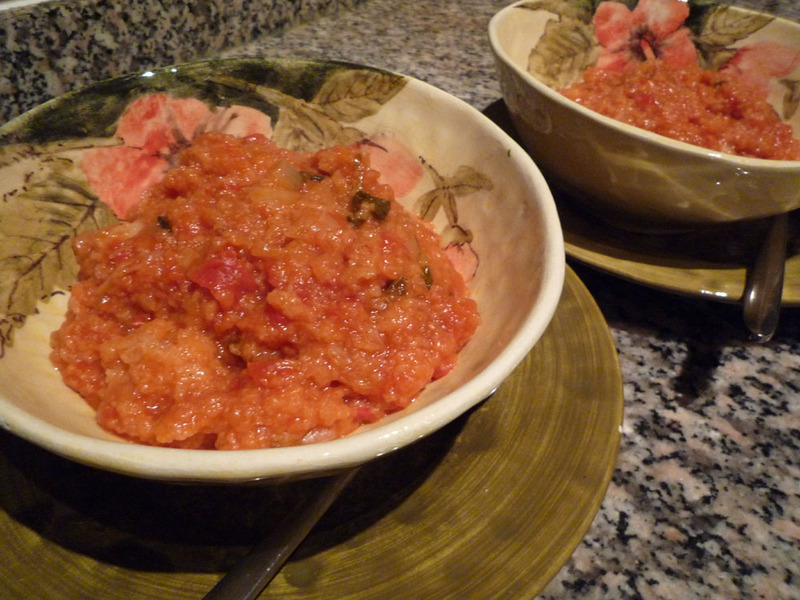 The second recipe I tested was pappa al pomodoro, which is a thick tomato and bread soup. I have always like this and thought it was hard to make, but it was so easy (said husband saw that I was finished preparing it and said “that’s it?!”). 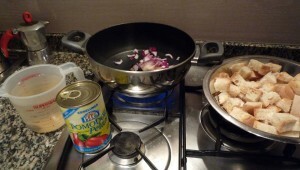 It is a warm, filling, cheap and easy meal. I think this is going to be something I’ll make weekly this winter. It’s Sunday, and while those of you living in places that have Sunday shopping probably do not recall this predicament, being Sunday night usually means scraping around for ingredients to make dinner. One thing I always have in the house is stale bread (often unfortunately moldy, too), a tin of tomatoes, and onions, so yay, I could make the pappa. (Actually, the recipe called for a leek, but I substituted a certaldo red onion.) I also learned why most peoples’ pappa burns my tongue – it has peperoncino (hot pepper) in it. I omitted both this and the garlic. From making this soup I learned that one should follow the amounts that Judy provides in the recipe at least once. I did not have enough bread (requires 1 pound or about 450 grams)… I had about 200 grams of bread, so I tried, with faulty math, to apply a 2/5 ratio to the amounts and ended up with something rather too solid. This emergency was easily averted with some water and extra tomato, and the results were excellent. This meal was also Tuscan husband approved, and I have expanded my culinary vocabulary by approximately 20%. Now, for the book giveaway! Post your answer in the comments section of this article. I will not approve the comments for 48 hours, so you cannot see the other answers. The first person to correctly answer and correctly spell this soup wins the book! And yes, there’s a recipe for this in Diva’s book on page 143! The winner’s name will be announced in the article, via twitter, and via the arttrav facebook fan page. I will contact you via the email that you use to leave your comment (which will not be published) for your mailing address, and then endeavour to mail out the book asap. This contest is open to everyone except Judy and my mother ;-). The winner is Melissa Harshman, who responded within 10 minutes of this post going online, with the correct spelling of Cacciucco. I just love saying cacciucco, don’t you? Bad Uffizi news: the Tribune is closing!